Home / Annabelle Rama / E! 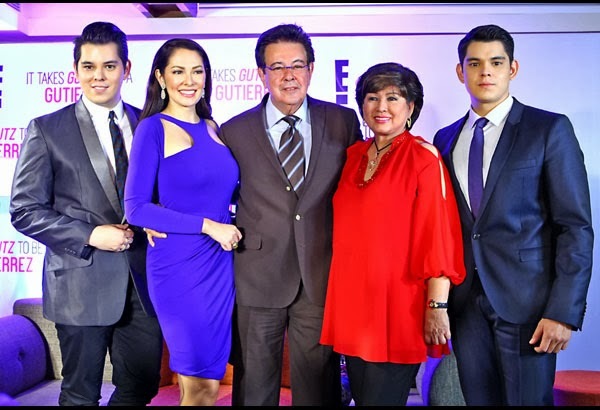 / Eddie Gutierrez / It Takes Gutz To Be a Gutierrez / Raymond Gutierrez / reality TV show / Richard Gutierrez / Richie Paul Gutierrez / Ruffa Gutierrez / Sarah Lahbati / "It Takes Gutz To Be a Gutierrez" reality TV show set to air on E! "It Takes Gutz To Be a Gutierrez" reality TV show set to air on E! A first of its kind in Philippine TV, the Gutierrezes, a known Filipino celebrity family, will star in a reality-based TV show which will soon air on the cable channel E!. Entitled "It Takes Gutz To Be a Gutierrez," the program will showcase the veteran showbiz couple Eddie Gutierrez and Anabelle Rama, daughter Ruffa and twin sons Richard and Raymond Gutierrez. The show will also feature Sarah Lahbati, Richard's girlfriend. Aside from the known Gutierrezes, Elvis, Rocky and Richie Paul will also be part of the show and even the Gutierrez grandchildren. "It Takes Gutz To Be a Gutierrez" will premiere this May on E! SkyCable Channel 57, Cignal Channel 25 and Cablelink Channel 33.